Village. oil on panel. Signed with label to reverse. 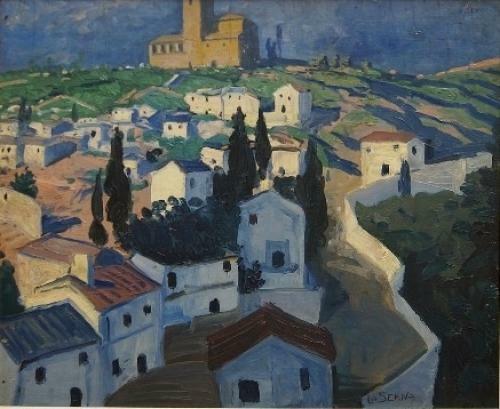 La Serna studied at the Academy of Art in Madrid, and as a young man was a close friend of Federico Lorca. In 1921 he settled in Monasse in Paris, which he became acquainted with Gris, Soutine, Kisling and in particular, Picasso. Although first influenced by the French Impressionists, his move to Paris inspired a stylist change toward the cubism of Picasso and Braque. According to Terriade ‘His art is the natural link between reality and the abstract.’ In 1917 he illustrated Lorca’s first book (Impressions and landscapes) and in 1928 he illustrated the Sonnets of Gongora for the cashiers d’art. La Serna took part in group exhibitions, including those at the arts centre in Granada in 1933; the Jeu de Paume in Paris in 1936; the Spanish Pavilion at the Paris International Exhibition in 1937; the Galerie Berri in Paris in 1938, 1947 and 1948; Contemporary French Art at the Museum of Fine Arts in Mexico in 1956; the Tate Gallery in London in 1963 and St Etienne Museum in 1964. He exhibited before his move to Paris, most notably in Madrid in 1919. His exhibition career was long and spanned from New York to throughout Europe. His work is represented in the permanent collections of the Musee D’Orsay in Paris and the National Gallery in Berlin.